I came across the original pattern on the 'net, and tweaked it in a few places particularly so all the teeth happen at once in the middle of the last row. It's a very forgiving pattern - if you miss the odd 2 tr in 1 tr, or only 6 instead of 7, it won't really matter. 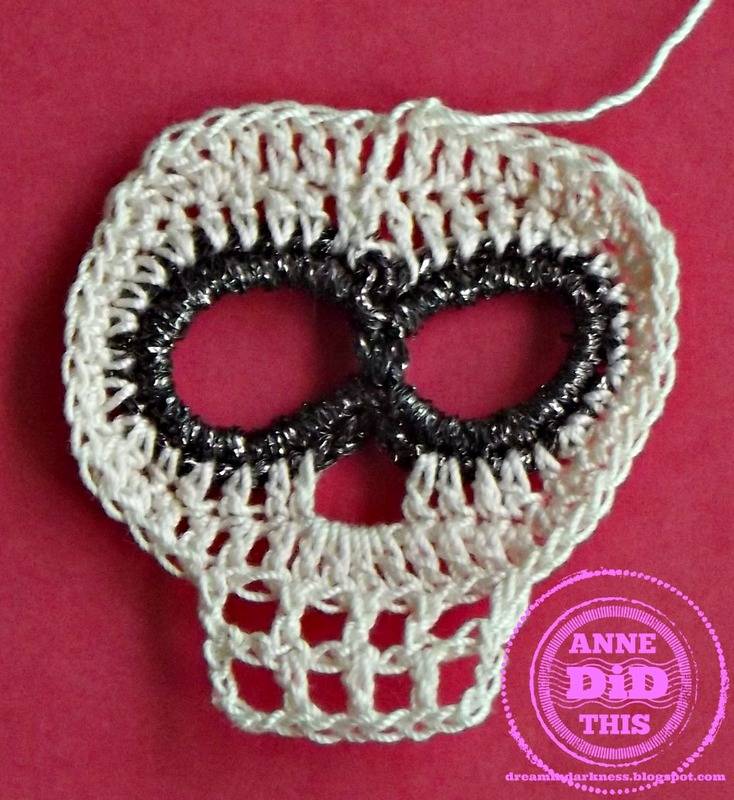 Finished size depends in the thickness of yarn and crochet hook you use. Again, I was brought up on English terminology. Any Americans, dc is sc (symbol x), treble is dc (symbol T ). I have no idea what Americans call a half treble (symbol T ). 1. Chain 24. DC in 13th chain from hook, slipstitch in last stitch. 2. Catching in the tail as you go (saves sewing it in later), 20 dc in first circle, 20dc in second circle. Slipstitch into start. 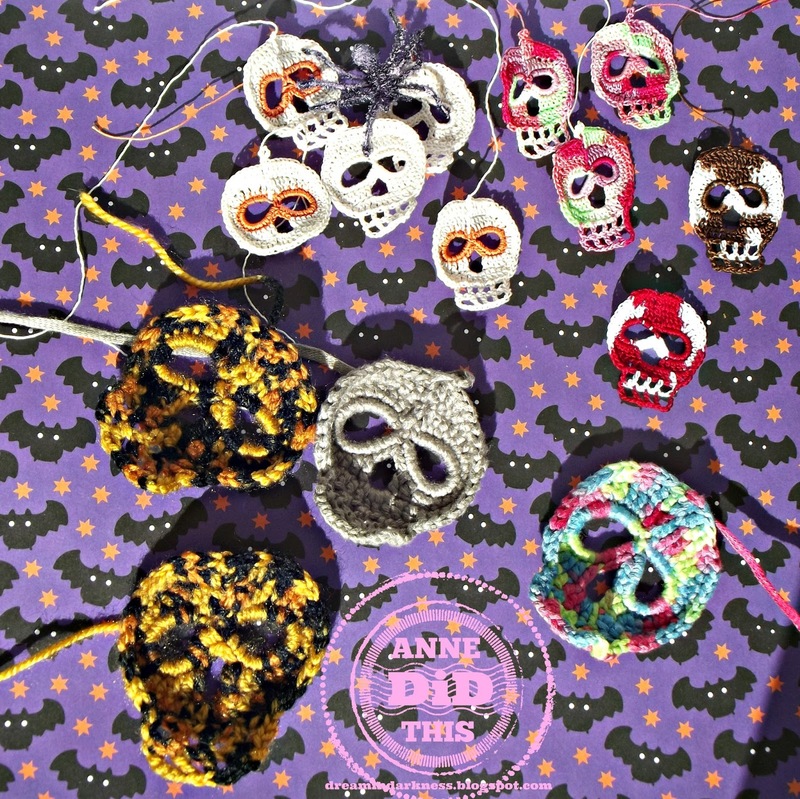 Change yarns here if you want different-coloured eye sockets like the orange & cream skull in the picture. 3. Chain 3 (= treble), treble in next 4 dcs, 2 half-treble in next dc, half treble in next dc, dc in next 5 dcs, half treble in next dc, 2 half trebles in next dc, treble in next 4 dcs. Treble in next 4 dcs, 2 half trebles in next dc, half treble in next dc, dc in next 5 stitches, half treble in next dc, 2 half trebles in next dc, treble in next 5 dcs. Slipstitch into top of chain 3. 4. Chain 3 (= treble), treble in next 4 stitches. 2 treble in next stitch, 2 half trebles in next stitch, half treble in next stitch, dc in next 7 stitches, 2 half trebles in next stitch, half treble in next stitch, treble in next 4 stitches. 4 treble in the chain 4. treble in next 3 stitches. Work teeth here: Chain 4 (= treble, chain 1), turn work, miss 1 stitch, treble in next treble, chain 1, miss 1 treble, treble in next stitch - repeat to create 4 teeth (ch 1 gaps). Chain 4 (= treble + chain 1), turn work, treble in next treble, chain 1 treble in next treble until 3 tooth gaps. Chain 4, slipstitch in 3rd chain of loop below, slipstitch in next chain and in top of treble. This brings you back down to where you started the teeth. Treble in next treble. Half treble in next stitch, 2 half trebles in next stitch, dc in next 7 stitches, half treble in next stitch, 2 half trebles in next stitch, 2 trebles in next stitch, treble in next 5 stitches. Slip stitch into top of chain 3. If you want a swing loop, chain 5, slipstitch in top of chain3 again. With or without loop, cut thread, pull through last stitch. Darn the loose end in, or keep it for stitching into something else later. 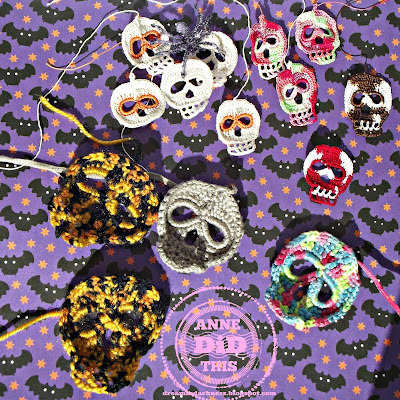 Otherwise run FAST to the next link in the 31 Days of Halloween Blog Hop. It's been a long time since I crocheted. Oh I am going to have to have a go at these!! These look so awesome! I think the frog will just have to know that the pink really makes these stand out.